Out of a million details you need to think about, this conference has an added complexity, the delegates or attendees come from all over the world and they either need language assistance or for diplomatic reasons you are required to provide the spoken word into various languages. You diligently go out there to find the most experienced conference interpreters or you find a language service provider to source them for you. You make sure you follow the recommended best practices and that they are a good fit for your event. The outcome, you can now tick the box, you have solved the multilingual component. Now you can go to the next line item on your to-do list… but wait, slow down! Have you kept a close eye on the other half of the deal? Simultaneous interpretation requires quality interpretation equipment, a reliable audio system and competent technicians. Failing any of these and you are back to square one. You can have the top interpreters in the world, but without the right tools they can’t do their job to the best of their ability. Nothing wrong with outsourcing the rental of conference systems to another department or to venue service providers, but understand they might have a long list too and your requirement might not be at the top of that list. They are possibly being pulled in different directions to either integrate a technology piece that serves no purpose, being asked to get cables hidden away at all costs or dealing with a tight budget. The point is that no matter how many flashy technologies are showcased and how neat a room looks, unless the discourse can clearly be heard in all supported languages, you are on the losing team. You won’t only have snoozing attendees, you will have frustrated ones too!! Let’s just say that ‘my friend’ learnt this from experience (disclaimer: it was a test event) and that she never repeated the same mistake again. Audio intelligibility in all the meeting is the very basic requirement for any event. Get that right and at the very least the conference’s message has been communicated, first step in the right direction towards a successful conference. You will want to make sure your vendor’s equipment is on top of the latest development in simultaneous interpretation technology. Digital Infrared is now the gold-standard in language distribution for providing a clear and crisp interpretation transmission. There are convenient features added to the mix too such as relay, auto-relay and live rewind. Analog systems present issues such as light interference especially in direct sunlight and fluorescent lighting typically found in conference rooms. Infrared boasts immunity from radio frequency, less susceptibility to interference and higher security. Ensure the interpreters’ insulation booths are compliant with current ISO standards, a fully encapsulated booth avoids interference from surrounding noise and eliminates distraction to the audience. Bottom line, make sure you have the appropriate expertise and technology, one can’t go without the other when it comes to conference interpreting. Consider vendors who serve a niche as they are highly focused on addressing specific needs and have greater knowledge depth. Last but not least, can your vendor scale to the size or type of meeting you are planning? Their references should speak for themselves. Beyond making sure your vendor can handle both the quality and the volume you need in the time you need it, apply the Golden Rule for selecting any type of relationship – ensure both parties commit to a partnership built on mutual trust. 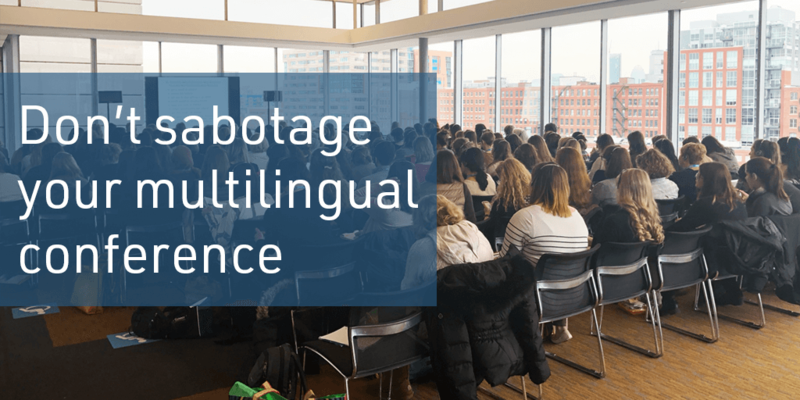 Do you need help executing your next multilingual event? Contact us today.